VERY often, I get stopped by journalists asking for my response to current and sometimes controversial issues. Due to the lack of time, it is simply not possible to communicate carefully thought-out policies in a few sentences. As such, my responses are sometimes taken out of context. This has prompted me to embark on this fortnightly column to enable me to speak directly to the public to narrow the information gap between the Government and the rakyat, as the welfare of our people is our top priority. In this column, I will focus on strengthening public understanding of the challen­ges of our public transport system – and how the Government aims to address them over time, as well as my opinions on current issues that affect public interest. Policymaking has always been and conti­nues to be complex and contentious. There will always be people who will not see eye-to-eye or agree with some of the Government’s policies and that’s understandable. How­ever, as a publicly-elected official, I have a duty to my constituents to explain these policies. Unfortunately, a quote or two in a press release is not enough to explain the rationale behind some of the actions that I’ve taken. Take, for example, the Transport Ministry’s decision to ban the app-based motorcycle ride-sharing service Dego Ride. In recent months, the Transport Ministry and I have come under pressure for our decision. A minister and a party leader’s job is not just about defining clear policy objectives and ma­­king decisions – being a good listener is also part of the job description. I am determined to use this space as an opportunity for constructive dialogue. It is important to highlight that this decision was not made on a whim – it was the result of the careful and considered input of many experts including special advisers, civil ser­vants and non-governmental organisations concerned about the safety of Dego Ride’s service (http://www.thestar.com.my/news/nation/2017/02/13/liow-we-can-act-against-dego-ride-motorcycle-taxi-service-provider-needs-a-licence-to-operate-says-m/). Last year, the number of accidents stood at 521,466 – and took the lives of 7,152 people, according to PDRM data. Of these, motor­cyclists contributed to 62.7% of deaths on the road, compared to car drivers 20.8%, pedestrians 7.1% and lorries 2.6%. The risk of fatality and being seriously injured when one travels on a motorcycle is also 48 times higher than compared to travelling on a bus and 6.2 times higher than in a car over the same distance (http://www.thestar.com.my/news/nation/2017/02/03/way-too-many-road-accidents-liow-says-too-many-lives-lost-and-its-too-costly-to-bear/). These numbers are completely unacceptable. As I’ve mentioned previously, I’m more than open to meeting the operators of Dego Ride but the Government is firm in maintaining the ban of the service as public safety is not something we take lightly (http://www.thestar.com.my/news/nation/2017/02/15/cabinet-confirms-ban-on-dego-ride/). My main priority is to ensure that we have an efficient, cost-effective, reliable, comfortable and safe public transport system. There are no quick fixes when it comes to guaranteeing public safety. Safety risks need to be managed – and this is what I intend to keep on doing. Contrary to what has been expressed by certain parties, the Government encourages innovation and technology to solve the nation’s traf­­­­fic congestion problems (http://www.thema­­­­lay­mail­online.com/malaysia/article/dego-says-will-ride-on-despite-ministers-order-to-cease-ops). A look at some of our recent developments such as the MRT Sungai Buloh-Kajang Line, LRT3 and Malaysian-Singapore high-speed rail (HSR) serve as proof that the Government is com­­mitted to the long-term investment of a mo­­dern, world-class urban public transport system. The LRT3 is the first rail project with green technology in Malaysia, incorporating rainwater harvesting technology, noise reduction and better energy management systems as well as natural ventilation in the designs of the stations. Once completed by 2020, the 37km-long LRT3 line will connect over two million people between Bandar Utama and Johan Setia, Klang. The HSR line, on the other hand, will include a double-track on standard gauge and will be powered by proven high-speed technologies. Trains on the line are expected to run at a speed of 300km/h. Commuters will be able to travel between Kuala Lumpur and Singapore in under 90 minutes. These are game-changing projects that will contribute to a thriving economy. More importantly, the projects will improve liveability by ea­­sing traffic congestion, providing better accessibility and substantially impro­ving and integrating urban public transportation for the rakyat. Another role which I hold with equal importance is my role as president of the Malaysian Chinese Association (MCA). Just over a week ago, MCA donated RM1mil to the Tun Tan Cheng Lock Centre for Social and Policy Studies at Universiti Tunku Abdul Rahman to fund various activities and research in areas such as the history and contributions of Chinese Malaysians and our founding fathers, nation-building, ethnic relations, and social policy. The founder and first president of MCA, Tun Tan Cheng Lock was a fearless leader who de­­voted his life to championing the rights and the social welfare of the Chinese community in Ma­­laya. I intend to carry through his vision of ensuring that the voices and concerns of the Chi­­nese community are heard by the Govern­ment and that we have a say in the country’s affairs. A minister and a party leader’s job is not just about defining clear policy objectives and ma­­king decisions – being a good listener is also part of the job description. I am determined to use this space as an opportunity for constructive dialogue. Thus I highly encourage readers to write in and share their thoughts. I hope they will join me on this journey in the months to come. 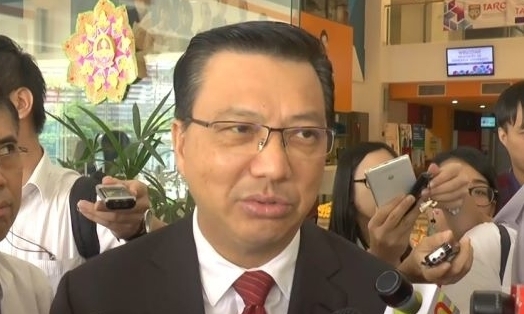 Datuk Seri Liow Tiong Lai is Transport Minister and MCA president. The views expressed here are entirely the writer’s own.